CarotDAV is a powerful multi-protocol file transfer software that can help you connect to multiple servers and remotely manage the files encountered. Launch CarotDAV and it looks surprisingly basic - little more complex than Notepad - but it's actually a very smart client which can help you manage FTP servers, WebDAV, SkyDrive, Dropbox, Google Drive, Box and SugarSync, as well as viewing GoogleDocs and IMAP servers. Once it's working, a simple file browser allows you to view the contents of a server, create folders, rename files, upload or download them (with resume support), and more. File transfers between your computer and a server rely on certain protocols, that is why having an application that can support several protocols is essential. 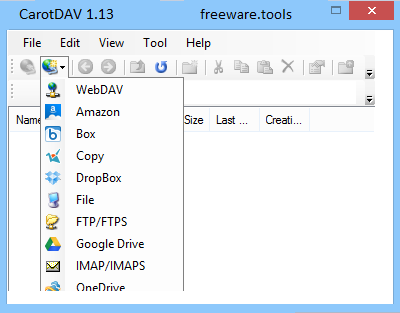 CarotDAV is a sturdy piece of software that can help you achieve quick file transfers, as it presents itself as a multi-protocol file transfer tool. This can help you connect to multiple servers and remotely manage the files it contains. In order to properly work, the application requires .Net Framework installed on your computer. The program allows you to connect to your favorite remote file storages and manage all the files they contain. You can connect to your WebDAV, FTP, OneDrive, DropBox, Google Drive, Box or SugarSync remote storages and manage or organize any file encountered there. In addition, you are able to manage files from IMAP servers, which are normally used to store emails and other similar data. CarotDAV uses several protocols in order to connect to various remote servers and manage the data there, some of which are HTTP/1.1 (RFC2616), HTTPS (RFC2818), DAV class 1(RFC2518), 3(RFC4918), HTTP Proxy, Client Certificate, FTP (RFC959), and FTPS (FTP over TLS) (RFC4217, RFC2228, RFC2246). Using all these protocols ensures you that you can connect to any of your remote servers or file storages, then manage the data found within. To sum it up, CarotDAV comes as an all-in-one client for connecting and managing files from various remote servers and data storages. This means you do not need to use dedicated clients for each online repository, as the application is versatile and flexible enough to cover most protocols used by popular online repositories such as WebDAV, FTP, OneDrive, DropBox, Google Drive, Box or SugarSync.